In April, Anchorage became the first city in the nation to defeat an anti-transgender proposition that would have made it illegal for transgender people to use the locker room and bathroom that match their gender identity. SAGE Alaska was a part of the driving force behind the defeat of the proposition, and worked collectively with like-minded groups in the Fair Anchorage coalition. 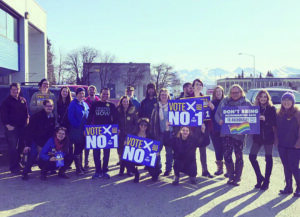 The coalition included the ACLU, Alaskans Together for Equality, Christians for Equality, Freedom for All Americans, HRC, Identity (which includes SAGE Alaska), the Pride Foundation, and Planned Parenthood. SAGE Alaska is a program within Identity, a statewide organization that provides support to LGBT older people. 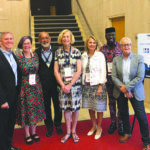 The need for a SAGE chapter in Alaska, which formed in 2016, was critical: In that state, the number of people 60 to 65 has increased 107 percent in the last 10 years. Alaska has the highest health care costs in the U.S., the highest long-term care costs, and a scarcity of affordable housing. SAGE Alaska co-founder Julie Schmidt says that the organization is focusing on how to overcome the challenges of a sparse landscape that exacerbates LGBT isolation. A statewide survey on the needs of LGBT elders in Alaska revealed three major needs of the LGBT aging community: access to LGBT resources and information; knowledge about activities and events; a variety of places to connect; and assurance about personal safety after being outed when they participate in LGBT events and services. 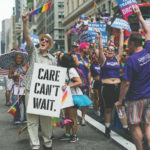 Schmidt says the chapter has already begun to dig in to these issues and identify strategies to help the LGBT aging community in the long-term. Find out more about SAGENet National Affiliates. This article originally appeared in SAGEMatters, Fall 2018.